Modeled on the Greek Corinthian helmet, this Beaufort Helmet features a classic style that is protective and recognizable, although it also features a few extra touches that help set it apart as a distinctive and unique helmet. 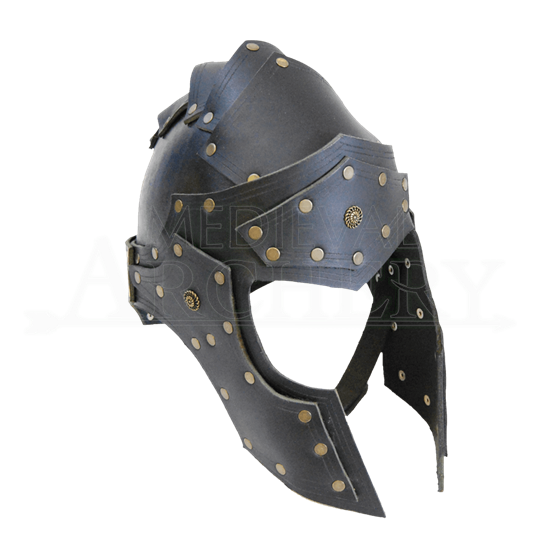 Like the classic Corinthian helmet, this leather helmet features a rounded crown and long cheek guards that help frame and protect the face without covering the wearers features or impairing his ability to see or speak. Where the helmet differs is partially in construction, as this helmet is not steel or bronze but high quality leather. 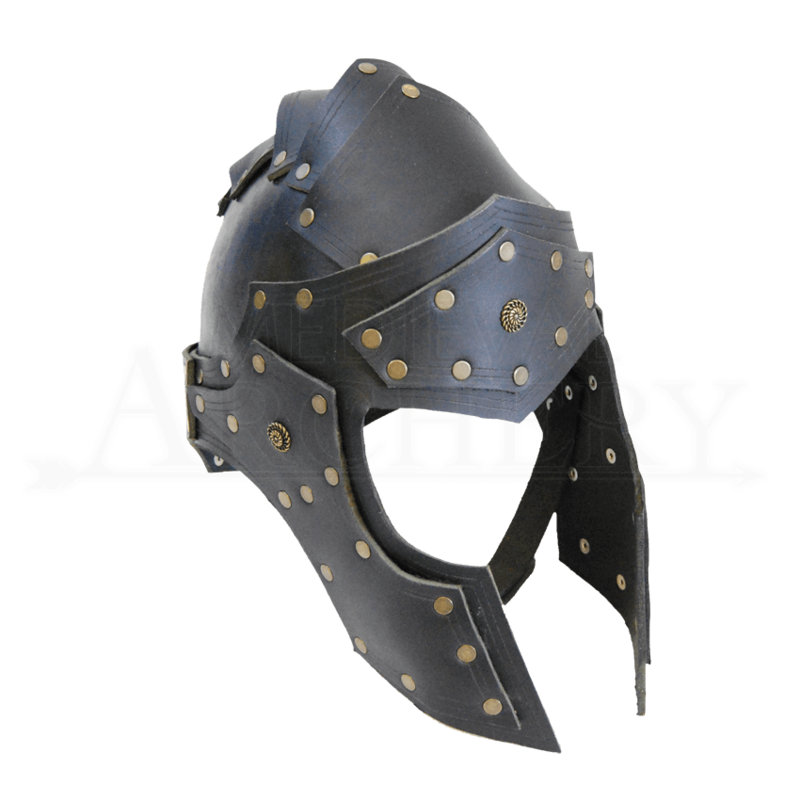 It also differs in that the forehead and the cheek protectors are adorned with additional leather plating, which has been riveted on for added strength and decoration, featuring bronze-hued rivets and small decoratively swirled buttons. The cap of the helm also has its own unique decoration, in the form of a low-set spine crest that runs over the helm and trails off towards the back. The helmet comes in two colors, brown or black. It also only comes in one size, which fits up to a 24-25 inch head measurement, although the helmet also features an interior buckled strap for securing the helmet on and adjusting its fit slightly. Smaller head sizes can off-set the difference by wearing an arming cap. There is no reason for you to have to enter into battle without sufficient head protection, especially not when this Beaufort Helmet is so readily available and provides such a great look and style to any warriors costume. i have an xxl head and this fits. size 9 basically. its a little tall in the crown, but i have been stretching it and molding it. would buy again.